We just spent a wonderful, restful long weekend away with friends in the Blue Ridge Mountains, during which I did absolutely nothing productive. It was nice. Really nice. Now I find myself trying to make up for it, though. I'm currently in productivity over-drive. 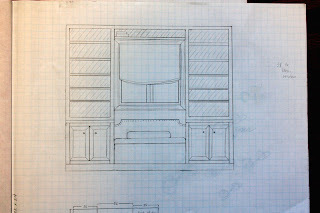 I pulled out my handy graph paper pad the other day and started sketching plans for our kitchen nook. I think my husband cringes whenever I start sketching, but some of our best projects started with this pad of paper. We recently moved the desk that used to be in the nook upstairs for my new craft room/office/future play room for the babies, and now everything that was piled on the desk is now on our little shelves that don't quite fill up the space. We're trying to cut costs (of course!) so we're doing a little creative shopping to pull this whole thing together. I'll be updating as we go, but I will say that so far we've spent $15 and we have close to 50% of the built-in purchased/built/put together -- not bad! Wow - I love it! 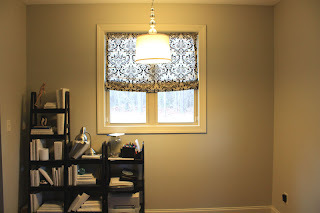 I was reading about someone who did a similar nook in a kid's room and it turned out great. 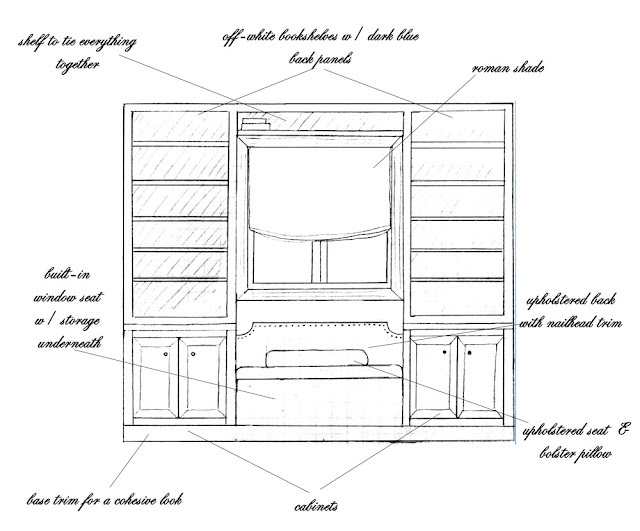 I love built-ins, especially when they include a window seat! I can't wait to see the final result! I have these visions of what I want to do in a space and I can see it like that, but can never express it on paper. That is remarkable. It will be a fantastic space. Good luck! I love it. Can't wait to see how it comes out. I love the plan!!... And I too LOVE graph paper! I agree some of the best things come from it! And honestly it is a lot less expensive to work out the kinks on graph paper than in real life, right? Good luck!